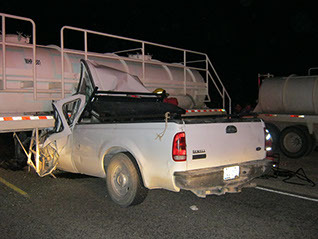 Commercial trucks are involved in some of the deadliest collisions on our nation’s highways. Every year, more than 20,000 people are injured in accidents involving trucks, 18-wheelers, buses, semis and tractor-trailers. Because of the complexity of state and federal laws governing interstate trucking, and the often-complicated corporate ownership of individual big rigs, filing a lawsuit after a commercial truck accident requires significant resources and exceptional legal skills. Our attorneys know how to stand up to the trucking companies and the teams of lawyers they hire to avoid compensating those who have been harmed in collisions with 18-wheelers. Beginning immediately after the accident, our attorneys investigate the event to ensure they have all the facts. Then, tapping into our network of accident experts, they work to determine what caused the collision and bring a lawsuit to hold the responsible parties accountable to the fullest extent of the law. Each one of these steps requires a skilled, experienced legal team with the resources to match those of the trucking companies and their insurers. Simon Greenstone represents victims and families of those who have been injured or killed in 18-wheeler accidents regionally and nationwide. If you would like to know more, contact us for a confidential consultation. What Should I or a Loved One Do After an 18-Wheeler Accident? First, stay calm. Call 911 if someone has not already notified emergency personnel and the police. If anyone has been seriously injured, wait until paramedics have arrived and do not attempt to move them yourself unless absolutely necessary. Cooperate with the police. If you were a driver of one of the vehicles involved, gather evidence such as cell phone photographs of the accident scene from as many angles as possible, information about the other parties, the police officer’s name and badge number and a report number. Take photos of the other drivers’ licenses, license plates and insurance information. If you were driving a vehicle involved in the collision, notify your insurance company. Seek medical attention. Some injuries take a few days to become noticeable and, without medical attention, they could become worse. 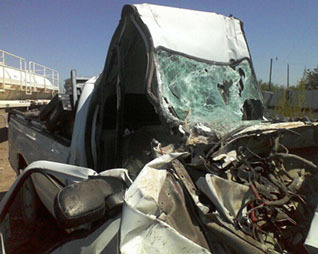 Contact an experienced truck crash lawyer. The hours and days immediately following the collision are the most important and play a critical role in your lawyer’s ability to hold the responsible parties accountable for their negligence, and to seek justice for the harms and losses suffered. Simon Greenstone’s truck crash legal team includes an experienced commercial pilot who can travel to almost any site, however remote, on short notice. Once you have secured the services of a lawyer who is experienced with truck accidents, your lawyer will work with all parties to secure and preserve all the relevant evidence. Do not accept a settlement from an insurance company until you have met with a truck crash lawyer who has experience taking such cases to verdict. Why are 18-Wheelers So Dangerous? The size of commercial trucks and the fact that they almost always travel above 60 miles per hour make them one of the most potentially dangerous vehicles on our nation’s roadways. In addition, their height and weight makes them susceptible to rollovers and their length creates a sizable blind spot and puts cars driving alongside them at risk. Most dangerous of all, however, is the fact that tractor-trailers take so much longer to stop than other vehicles, so they have very little margin for error when it comes to avoiding accidents. One other element contributing to the dangers of big rigs is the fact that many passenger vehicles are low enough to drive under the rear of the trailers. Known as “underride accidents,” these collisions are particularly dangerous because they often hit the top half of the passenger vehicles, where they are most vulnerable. Demands on drivers that force them to drive longer hours than allowed by law, often causing drowsiness and fatigue. This results in poor response time and greater danger to the motoring public. Sometimes, drivers can be under the influence of drugs or alcohol. Staffing cuts in volatile industries, such as oil and gas, that require drivers to work longer-than-usual shifts. Increased trucking traffic in rural areas that are home to “fracking” booms. These areas frequently don’t have the infrastructure or law enforcement presence to encourage safe trucking practices. What are the 18-Wheeler Laws and Regulations? Trucking accidents are not as straightforward as passenger vehicle collisions due to complex regulatory and liability laws including a patchwork of state and federal regulations governing commercial trucks. Causes of serious big rig disasters can range from improper hiring of truck drivers to disregard for state and federal laws that restrict the hours a driver may be on the road without a break or sufficient sleep, as well as the size and weight of the truck. In order to ensure that you and your loved ones receive proper legal representation, make sure your lawyer is familiar with the Federal Motor Carrier Safety Administration (FMCSA) regulations as well as the state regulations in the state where the collision occurred. If you have been injured due to the negligence of a trucking company or its representatives, you may be entitled to compensation to cover your losses and expenses, both in medical expenses and lost current and future income. You may also be entitled to additional damages aimed at preventing future disasters. Driver fatigue, distraction or impairment: When drivers don’t get enough rest, are not paying attention to the road or are impaired by drugs or alcohol, they are not in sufficient control of a potentially deadly weapon. Poorly maintained equipment: Because of the size and complexity of commercial trucks, they must be regularly maintained to ensure the vehicle is safe. Anything that can cause the driver to lose control of the rig – such as a tire blowout or brake failure – is a potential threat to other drivers. Because of the rig’s size, even a simple roadside breakdown can be a safety threat to others. Speeding/carelessness: When a driver is expected to meet unreasonable schedules, he or she may resort to driving at unsafe speeds or failing to practice safe driving techniques. The results can be disastrous. Unsafe payloads: Even the safest driver in a well-maintained vehicle can cause a disaster if the payload is heavier than allowed or it is improperly secured. Distracted driving: According to the FMCSA, the odds of being involved in a crash are 23.2 times greater for truck drivers who text while driving than for those who do not. Serious injuries result in medical bills that can total hundreds of thousands of dollars, as well as the potential for a lifetime of continued care that can reach into the millions. An experienced 18-wheeler accident lawyer can ensure that you have the resources to cover those expenses, both now and in the future. The first question to ask a prospective attorney is whether the lawyer has tried a commercial truck accident case to verdict. The big rig lawyers at Simon Greenstone have represented multiple victims of truck accidents and secured significant verdicts and settlements on their behalf. We have represented the victims of semi-truck accidents and their families across Texas, from Dallas to San Antonio and Houston to Amarillo. In addition to our lawyers’ successful track record, we are also committed to providing excellent client service. Our goal is to help our clients navigate these traumatic events and move on with their lives. Contact us for more information or to schedule a confidential consultation.